Home / How to create and add a signature to messages in Outlook? 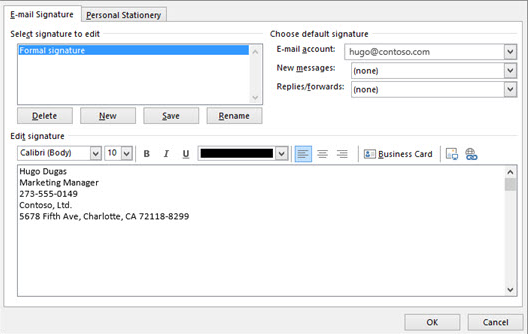 In Outlook, you can create a personalized signature for your email messages. Your signature includes text, images, business card, logo or image of your handwritten signature. There are many ways to add a signature to your Outlook emails. Some easy ways are discussed here for you. A new window appears, add your signature to it and in edit signature, you can create our signature and customize it with various colors, size, alignments etc. Under ‘choose default signature’ Fill ‘Email account details’ for which you want to create a signature. You can add the signatures to new messages or on all email messages, you can specify it in ‘New Message option’. Similarly, you can set an option ‘Replies/forward’ so that your signature will appear only to the messages you reply to and forward. Under signature, a new window is opened. In Edit signature, choose the signature you want to add in the logo or image. Select Image icon next to Business Card and locate an image file or logo to it.